Fluid London blog - musings from the bar and the restaurant table: Roof Terraces in Soho Are A Rarity, Aren’t They? What do you get if you mix a python, sweet potato croquetas, belly dancers, soap that you can only buy in Harrods, champagne with rose syrup, and a load of shisha smokers? Why, El Cantara of course, the latest restaurant to open in Soho. 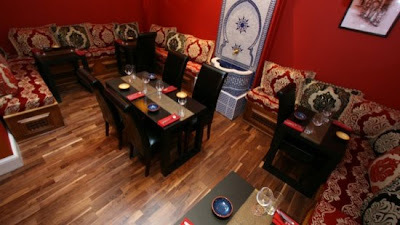 Located on Frith Street, this Spanish and Moroccan restaurant is a feast for all the senses. El Cantara isn’t a huge venue, but it is sprawling with several levels, inside and outdoor space, and plenty of nooks and crannies. Let’s start at the bottom. In fact, let’s start in the ladies on the basement floor and explain about that soap. Like the entire restaurant, the bathrooms are exquisitely furnished and decorated. As you come to wash your hands, a large plate of organic Moroccan soap from Harrods awaits you. Dip your paws into the sludge and rinse off for a soft and sweet-smelling result. 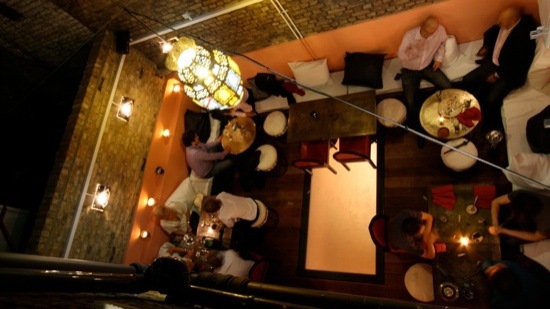 Back into the basement bar and beautiful wooden furniture, candles, and terracotta tiles create a relaxed drinking den. Up the stairs (which are strewn with rose petals for opening night) and on the ground floor we have the restaurant. Pick from a table at the front watching the hustle bustle of Frith Street go by, or a table at the back by the bubbling fountain. Sumptuous canapés of Spanish sausage kebabs, beef tagine, sweet potato croquetas and fragrant sweet pastries are handed around along with champagne cocktails (champagne, rose water, rose syrup and cranberry juice). The food really is sumptuous – high quality, big portions (you gotta love generous canapés) and beautiful, mouth-watering fragrant flavours. 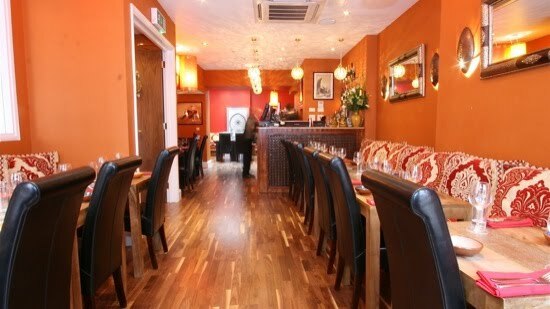 Up the stairs again and it’s an extension of the restaurant and bar, with more Moroccan chic. The place is heaving with guests and we head outside on to the terrace. A rarity in Soho to have outdoor space, unless you’re at an expensive private members club, or sitting outside a cafe in the street, this is one of the best bits of El Cantara. It’s only small (what do you expect? This is Soho) but the owners have cleverly hung up a coloured lantern to give the sense of it being another room, rather than a random bit of outside space. Together with the over-sized cushions the terrace smacks of relaxation in a hip, expensive beach bar in Andalucía. This is where the guests are smoking shisha. My friend and I are busy discussing the wonderful food and willing a waiter to fight through the crowds and present us with more. The seats and cushions are so comfortably squishy and well, we’re too lazy to get up. I glance up, ‘where are those waiters? Ooh what’s everyone looking at? Ah, another belly dancer. Yes, she’s pretty. All those men are gawping at her. Oh, and some of the girls. Oh, are they stroking her? What’s going on? Aaghh!’ That’ll be the python then, wrapped around the pretty belly dancer’s neck. I almost spill my cocktail over my friend in fright. After we’ve got over the shock, and finally found some more of the sweet potato croquetas to stuff down our throat, we call it a night. Goodbye beautiful El Cantara, and the smell of shisha, rose-scented drinks, and the taste of those fragrant dishes. We’ll be back, but at a table far away from the snake, or better still, on a night when the dancer leaves him at home.